I have owned this Landrover for six years after exchanging it for my previous 1966 Series Two Landrover. NTA 941M is an August 1973 model. Because it was registered in August it misses the Tax free historic vehicle by sixth months!!! It has a 21/4 petrol engine and weighs 2 ton, it was hand built at Solihull. The Series Three Models ran from 1971 TO 1985, some say they were the last of the “real” iconic Landrovers. Series Three Landrovers are immediately recognisable by their ABS plastic grille which replaced the traditional wire mesh grille. My Landrover is an 88-inch Station Wagon. The general lines are like those of the series Two and Two A Models which preceded it. Station wagons came with a “Safari Roof “as standard. The model also had switches and dials directly in front of the driver for the first time. My Landrover had a new engine fitted after travelling 109709 miles and now has a galvanized chassis, so it should be good for another forty years! 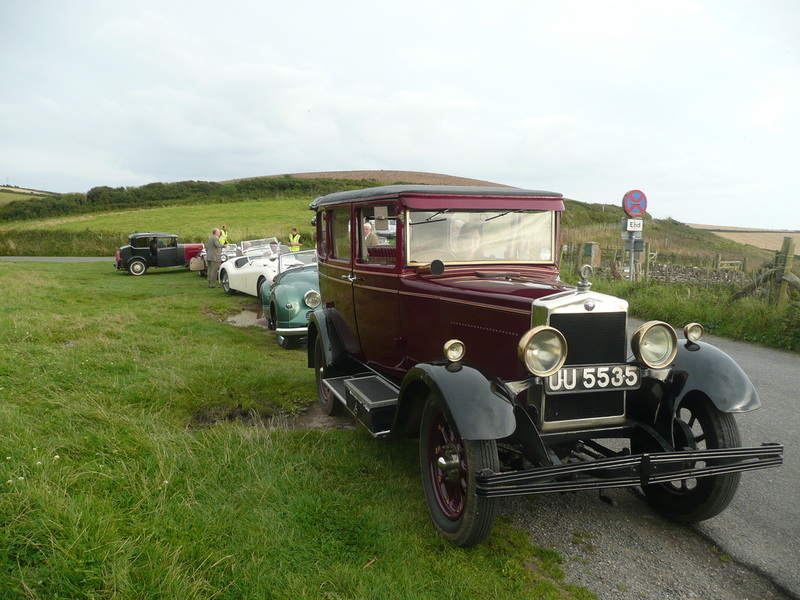 It is a local vehicle and was originally owned by Cherry May then of Newton Ferrers. The Second owner was Elburton Garage and there it was used as an everyday runabout by Dave. Elburton Garage fitted an overdrive so it now has 32 Gears!! 4x high ratio, 4xlow ratio, 4x high ratio four wheel drive, 4 x low ratio four wheel drives and then all of these multiplied by the overdrive. My Parents drove a Landrover exactly the same as mine, same model colour and year, across Africa in 1985. The only problem they had was a broken half shaft which was repaired at the side of the road by a “bush mechanic”. All the spare parts are very easy to obtain and are still made on the original jigs in India. They are also very cheap. I recently fitted a new water pump. A large cast iron component with a pump bearing which cost only £22 new!! 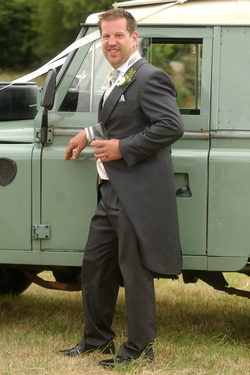 My Landrover is used everyday and during the time I have owned it has never failed an M.O.T. It all started with a phone call, ‘ Is that Maurice Williams’ reply ‘Yes’. 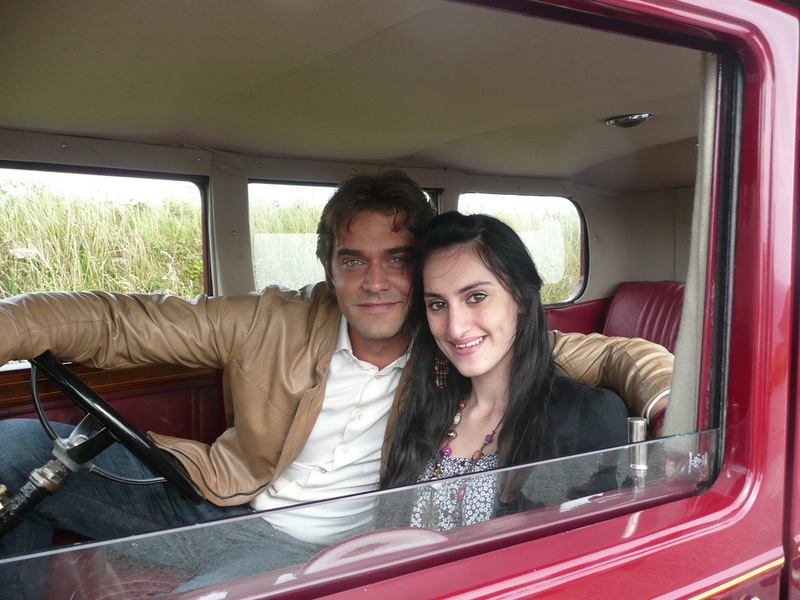 ‘ We want some classic cars for a filming’. ‘Val Edgecumbe says you are the man to talk to’. Reply ‘Yes no problem , give me your email address and I will send you a list’. ‘Great, you have a list, will it have all makes’. reply‘Yes’. ‘ Great, I have been to a lot of clubs and no one has a list’ reply ‘Should have come here first, we are organised’ ‘We went to the MG club and they only had MG’s’. reply Didn’t the name of the club suggest anything’. ‘Perhaps it should have’. And then it all started. Our link being Clare Keyte. The film which goes out on ZDF, one of Germany’s most popular television channels is a Rosamunde Pilcher film ‘Let there be love’. The story revolves around a classic car rally. 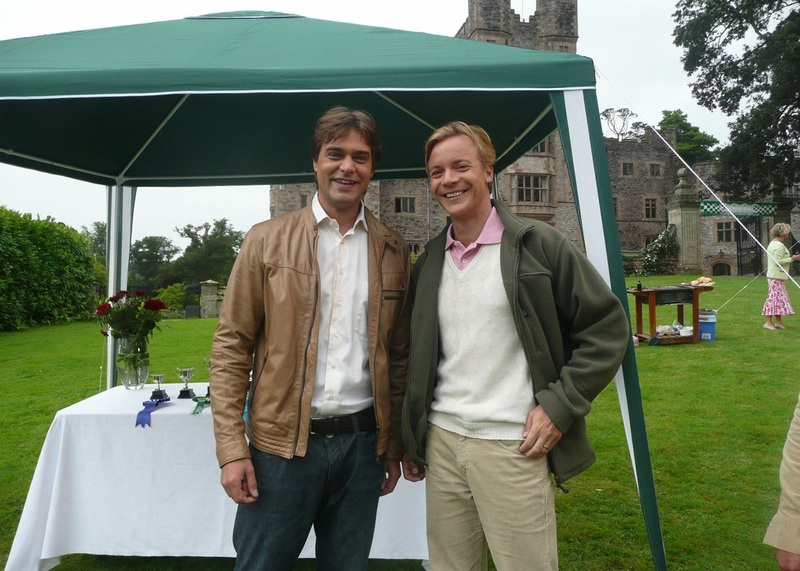 Flete House, where much of the filming was done is supposed to be the home of the leading man and organiser of the Rally. His car breaks down on the rally and the leading lady comes along and helps to get the car going. Then the love story all takes off. She has a bit of history with a child which she wants to keep secret. The leading man has a crash at some stage and is injured and so on. I emailed our list of about 100 cars and back came a requirement to check availability on dates of 22 cars. Over half were in the 1920/30 range and when I questioned these were not classics and it was clear they didn’t know ‘together from which’. It was at this stage that it dawned on me that our list was quite a bit out of date. I also realised that the charming folk at Media Filming did not have a clue what cars were what so our contact, Clare spent an half day in my office at Bow going through all my reference books to see what each make and model looked like. Then checking their availability. The team from the Club who took part were wonderful by emailing car pictures to work from. 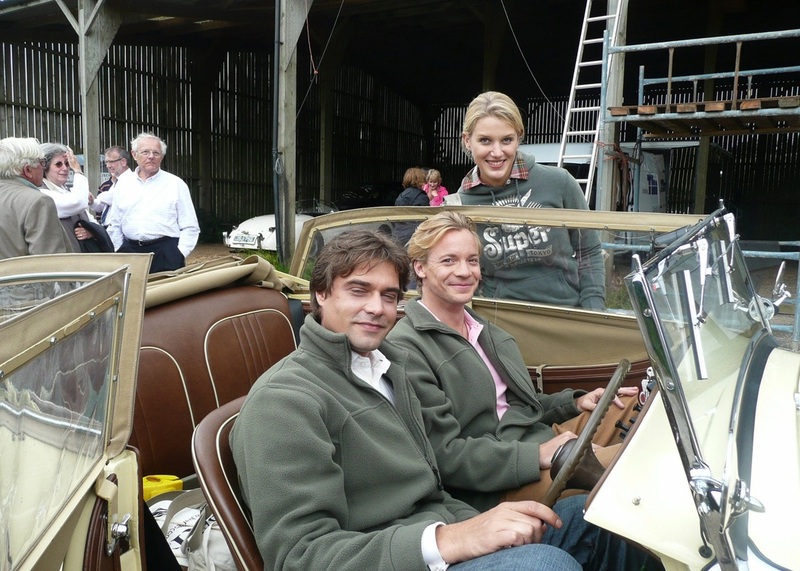 It was during this visit that Clare saw my garage and the Marlin I am restoring without an engine and no front suspension but a lot of rust and asked, ‘Can I have that car?’. The outcome was for me to fix a movement dolly on the front and they came with a Land Rover and trailer and carted the thing of to Boconnic House in Cornwall on 30/7 to create a workshop scene. The next day they arrived with a hire van and emptied my workshop of jacks, axle stands, my boiler suits, fire extinguishers, wheels, the lot. When I came to bring it back with Peugeot and trailer three days later I reckon it was getting on for nearly a ton of bits. They even took my brush so I couldn’t even sweep up. Mark and Ivor were involved at Boconnic with Dave Patten filming a workshop scene and later the ‘crash’ took place in the woodland track with fire tender and all the crash gear. 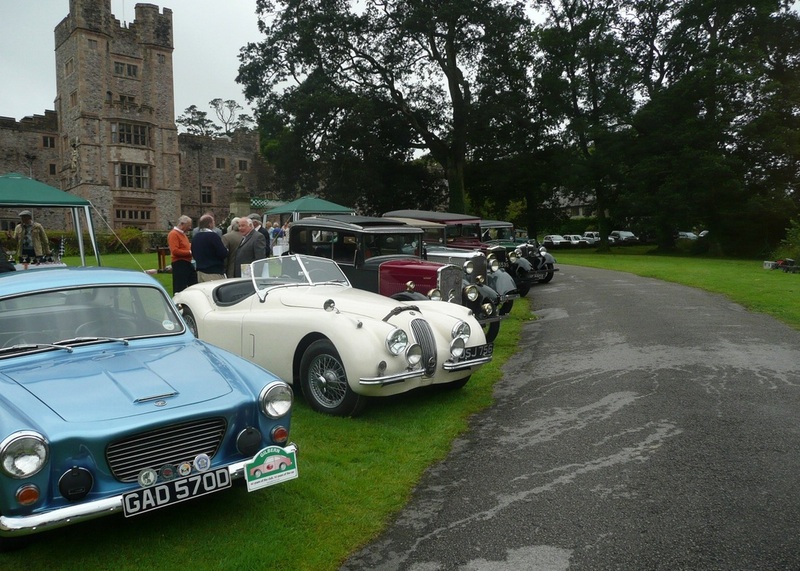 The original brief was for eight cars at Flete House Ivybridge to film the start and finish of a car rally, with some sessions with only one or two cars at other locations around the area. I have now found in filming that what is on today is changed tomorrow. In the end we put up something of the order of 27 car days. It was vital in the beginning that the lead car was an M.G. but in the end it looked very like a XK 140. We could not supply the XK although Robin Mace tried very hard to fit in, but the constantly changing requirements beat us. The lead car came from outside the Club with Dave Patten. 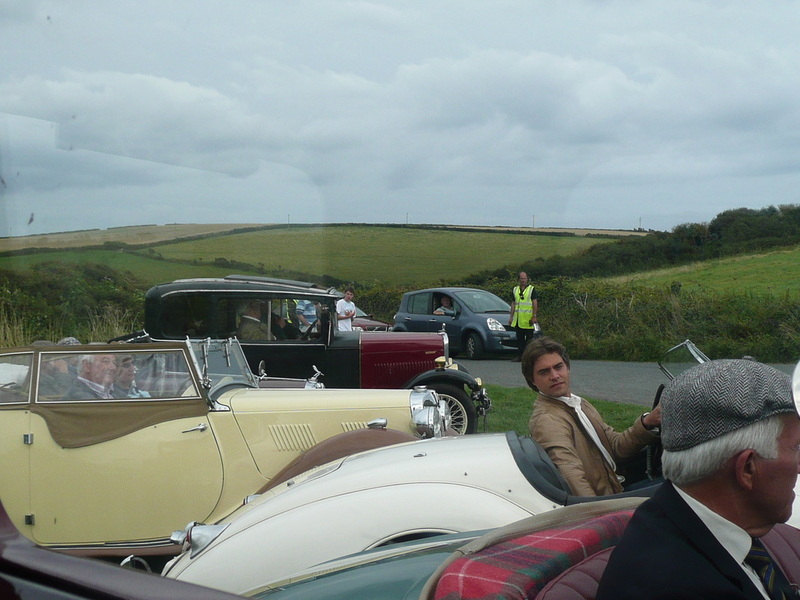 Mark Parkman, Ivor Harris and David Meldrum provided the cars for filming locations around Wembury and area. 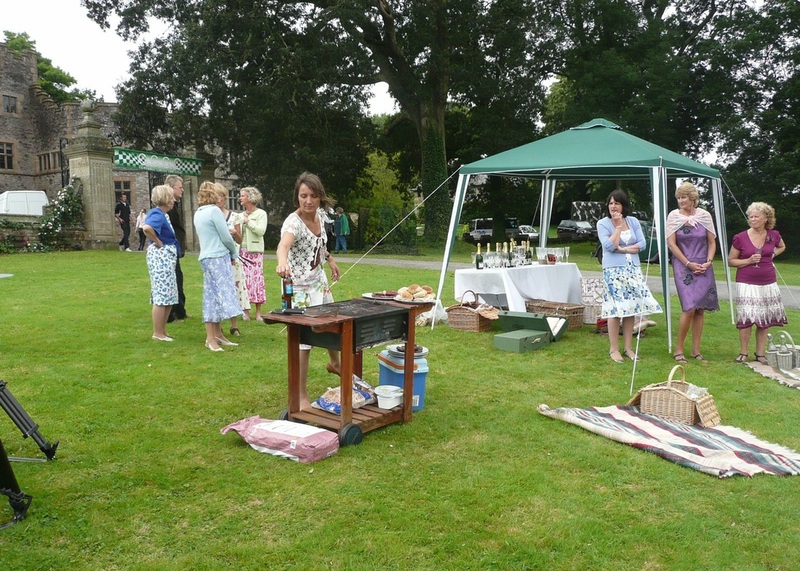 The first big car requirement was on 22/7 at Fleet House for the rally start and the finish with a picnic. Anil Koshti provided three cars from his stable with his friend Eric and Alan Kempster driving. Mike Davis brought his Jowett Jupiter, John Luscombe in his Swift, Mark in his Sprite and my Gilbern which the Director did not want until he saw it and then I could not get away. We had some laughs at this event and one of the best was late on the day before, Martine, the Directors Assistant rang Anil to ask him if he had any tweeds he could dress in. They wanted him to look like a perfect English Gentleman .Anil’s reply ‘I am an Indian but I will come as Gandhi if you like, that’s my special for fancy dress parties’. Anyway he turned up looking just like he always does, the perfect Indian Gentleman in his linen Jacket and straw hat. We finished this session at Hareston Farm somewhere at the back of Brixton for shots of five of the cars under covers in store. At this stage in the film the leading man was limping about on crutches because by now he had been in an accident. That was nearly 7-00 pm before that finished. 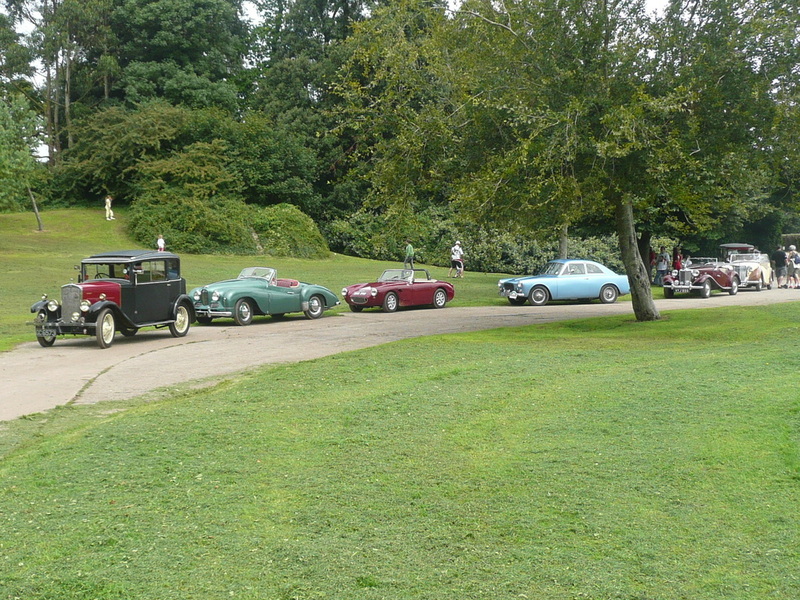 The second big gathering was for five cars at 7-30am at Mount Edgecumbe for dashing through the woods. At this stage we struck another one of the many problems caused by delays due to weather. Both Mark and Anil were due on holiday and of course continuity require the same cars. Anyway Anil put his holiday back a day by travelling to catch the cruise ship on the day it sailed. 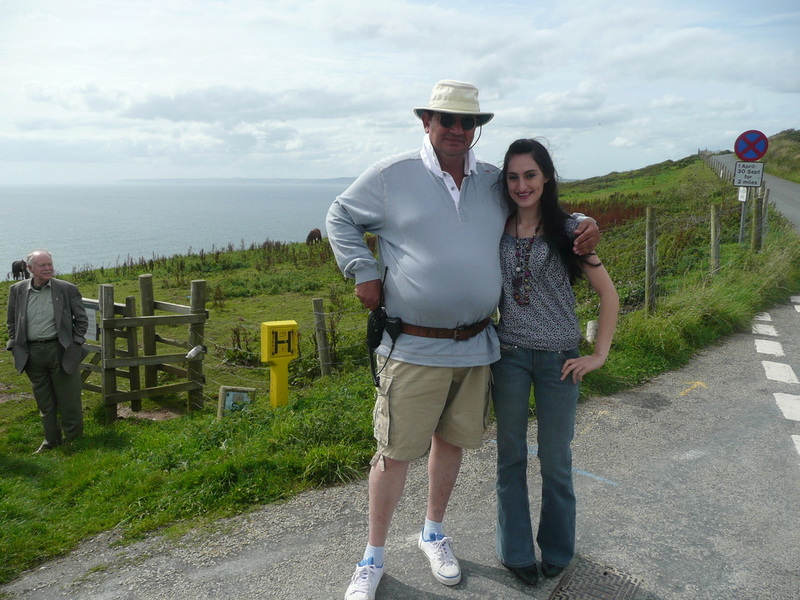 Colin Lennox-Jones had already expressed an interest to take part and his Sprite was a so near a match to Marks, both red, that the film company never saw the join The action involved backing down a goat track up in the deer park of Mount Edgecumbe and driving at speed out past the lead car which is supposed to have broken down. After being asked to speed Colin got a finger wagging from the Director for going too fast. We did that, I don’t know how many times before we were rested for about four hours. That driving was not the easiest as it was a very narrow track and one never knew what was hiding in the mass of ferns on each side that could damage ones car. Particularly difficult for John driving his Swift ‘Arthur’ because of his very restricted turning circle and the River Tamar beckoning below, We were allowed a very long break to enjoy an excellent lunch. We had already started the day with and English or continental breakfast which ever was to you taste. We were looked after extremely well. After our rest and lunch all beside the River Tamar in bright sunshine we were off for some road work. Whoever it was who started the myth that MX-5's are reliable and rust proof, was way off the mark on the basis of my experience. They are superb cars, just like some of our older vehicles, but also just like earlier vehicles they are very liable to rust and go wrong. Perhaps that qualifies them to be fully fledged classics now rather than the "Emerging Classics" that I have called them up to now. Or perhaps even the owner can be referred to as a fully fledged classic?